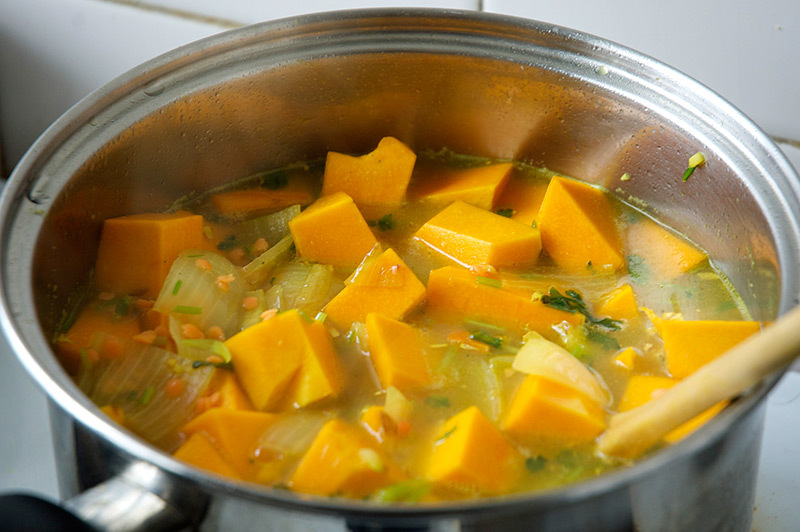 This incredibly wholesome and aromatic soup is packed with nutritious immunity boosting ingredients like turmeric. 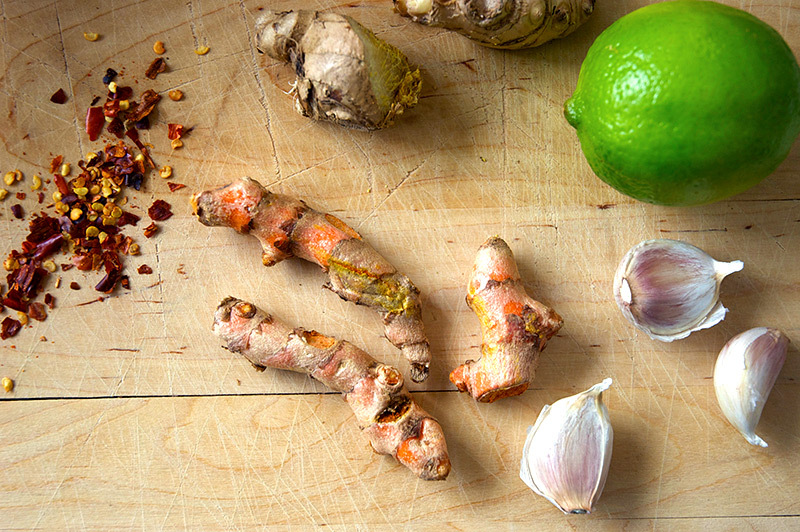 Turmeric is so good for us, and even better at this time of year. It’s warming, anti-inflammatory and immune boosting properties make it perfect to sneak into your meals during the winter months. You can substitute in turmeric powder here if you are unable to get root – use about 1 tsp. This soup is a great make-ahead option and freezes well before the addition of coconut cream (add upon defrosting). 70g | half bunch fresh coriander, roots and stems washed well and roughly chopped, leaves reserved for garnishing. 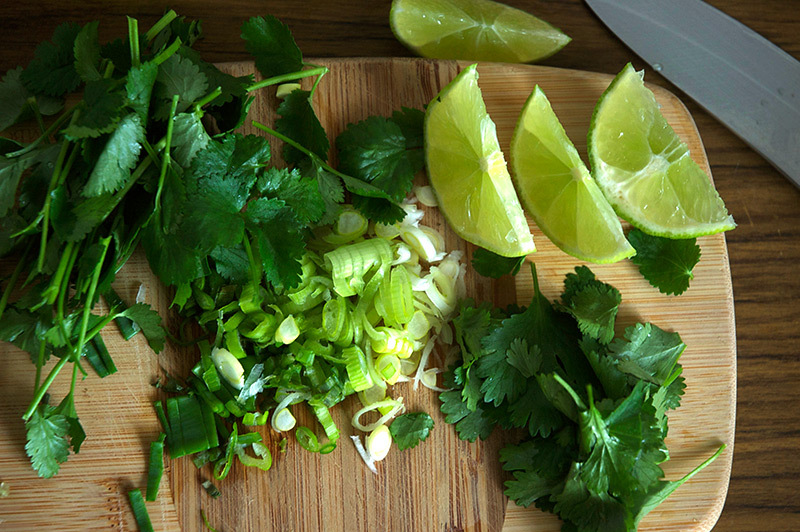 Coconut cream, fresh lime, thinly sliced spring onion and fresh coriander leaves to serve. In a large sauce pan over high heat, cook the onion in the coconut oil till softened. Add the aromatics: garlic, turmeric, ginger, coriander stems/roots and chilli, and cook for a couple of minutes till fragrant. Add the pumpkin, lentils and stock, bring to boil and then cover and reduce to a simmer to cook for 20min, or till the pumpkin is soft and the lentils are disintegrating. Once cooked, use a stick or upright blender to puree the soup. Return to stove and add the coconut cream and heat through, but do not boil. Just before serving add the lime juice and salt. Depending on the saltiness of the stock you used, you may need to be quite generous with the salt here. Taste, and trust your judgement. You really want to make the flavours pop, and pumpkin and lentils both need plenty of salt to give them flavour. Serve with extra lime wedges, a drizzle of coconut cream, and top with spring onion and coriander. This soup will keep refrigerated for up to 5 days, add extra water when reheating if soup thickens too much. If freezing, add coconut cream upon defrosting.